Carol and Bill have been Tri-State members for many years and are two of the most enthusiastic hostaphiles and plant collectors around. 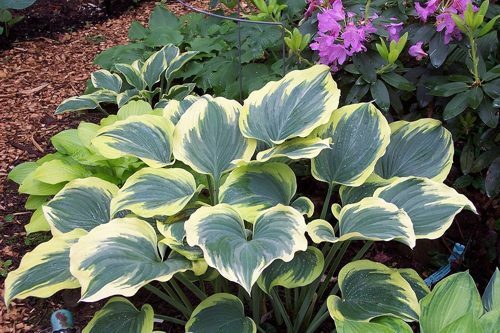 Their garden features over 1,000 of the newest hosta cultivars along with a wide range of other rare plants, including some that can be seen nowhere else. Bill is a hybridizer who has brought several plants to the market and you may get to see his other seedlings as well. Carol is well known for her collecting and her battles for the rarest plants at hosta auctions. It has been a number of years since the last visit from Tri-State so we are sure the garden has expanded even more since our last visit. 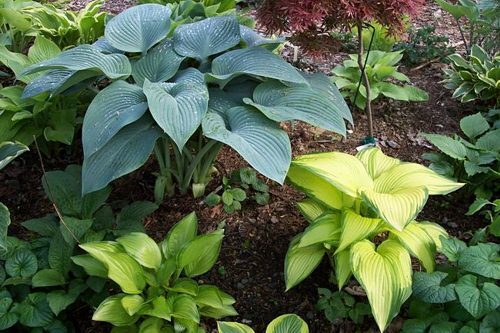 Come see the collections of rhodies, rare trees and shrubs, conifers, semps and sedums, hellebores, variegated annuals and perennials , and of course….hostas. Bring your notepads and cameras! After visiting the Brashear and Meyer garden, there will be a Members-Only picnic and auction at the Malkus Garden in Woodbridge, CT. Bring your appetite, a side dish, a salad, or a dessert to share, a chair and some plants for the auction. Tri-State will provide the meats, the paper goods, and the beverages as usual. From the South and West: Take Rt 684 North to Rt 84 East Travel East on Rt 84 to Exit #15 Turn Left onto Main Street North/US-6 at bottom of ramp Continue to follow Main St North/US-6 for 4.7 miles Turn Left onto CT- 317 at the traffic light Continue to follow CT-317 for 1.9 miles Make a Right on Mackay Farm Rd #16 is the second house on the right. Park on either side of Mackay Farm Road. From the North & East: Take I-84 West to Exit #17 Take Exit # 17 (CT- Route 64 exit) toward CT- Middlebury/Woodbury Turn slight Right onto Chase Pkwy/CT-64 Continue to follow CT-64 for 7.6 miles Turn Right onto Main Street South/US-6 at the traffic light and travel 1.0 mile Turn Left onto CT-317 at the traffic light Continue to follow CT-317 for 1.9 miles Turn Right onto Mackay Farm Road #16 is the second house on the right Park on either side of Mackay Farm Road.